The stylish blue Tricolore boot is made of Quick leather. The experts of the De Niro factory in Italy made this supple, Italian calfskin into a sporty riding boot with laces on the instep and a zipper at the back. In addition to this zipper, an elastic band makes the boot a very nice and easy fit and therefore very suitable for younger riders. What makes this boot so special is that the Quick Leather is extra smooth, so that the rider’s legs have more freedom of movement. The boots easily bend with the legs and are very suitable for both dressage and jumping riders. These riding boots are available in all standard sizes of De Niro. With more than 450 standard sizes, customization is only required in very exceptional cases. 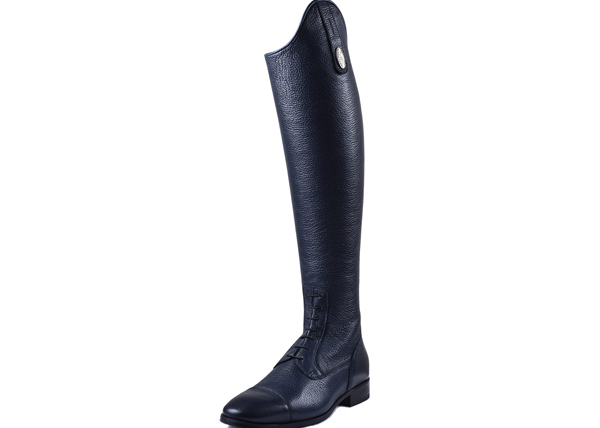 This riding boot is available in black, brown or blue.